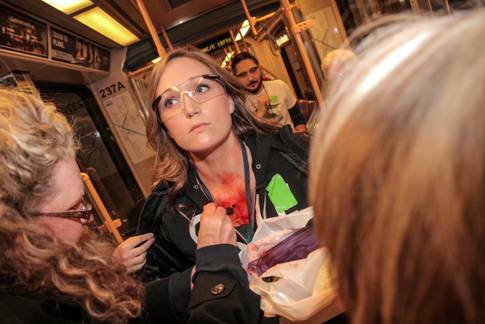 Volunteer actor/victims have simulated injuries for their role in the Washington Park Station drill. TriMet and regional first responders conducted a full-scale drill overnight at the Washington Park Station. The drill focused on how all regional homeland security partners responded to an active shooter scenario at the MAX station located 260 feet below the surface. TriMet secured a grant from the U.S. Department of Homeland Security (DHS) to fund the drill. TriMet Executive Director of Safety and Security Harry Saporta selected the Washington Park underground station for the drill because the site has limited points of access, either via a train or an elevator. The drill was conducted overnight during the few hours when trains are not in service. 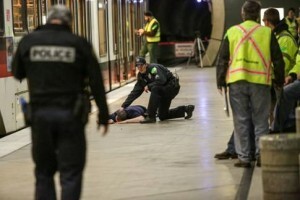 Police respond to a full-scale drill in the Washington Park Station. About 200 people participated in the drill, including U.S. Department of Homeland Security, Transit Security Administration, TriMet Transit Police, Portland Police, Beaverton Police, Hillsboro Police, Multnomah County and Washington County Sheriff’s offices, Portland Fire, Tualatin Valley Fire and Rescue, Portland Bureau of Emergency Management, Portland Bureau of Emergency Communication, EMS, TriMet safety and security staff, agency Public Information Officers, Oregon National Guard WMD Civil Support Team, C-TRAN and 42 volunteer actor/victims. “We really appreciate all of our partner agencies and volunteers who stayed up overnight to participate in this important drill, and help our region be better prepared in the future,” said Saporta. The drill was videotaped to be used in future trainings.